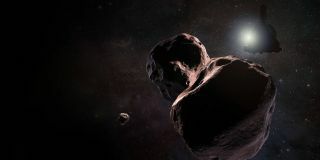 An artist's illustration of NASA's New Horizons spacecraft flying by the distant object Ultima Thule on Jan. 1, 2019. NASA's history-making New Horizons spacecraft may not be done with deep-space flybys after its highly anticipated New Year's Day encounter. At 12:33 a.m. EST (1533 GMT) on Jan. 1, New Horizons will zoom within 2,200 miles (3,540 kilometers) of the small, mysterious object Ultima Thule, which lies more than 4 billion miles (6.4 billion km) from Earth. This visit will be the most distant flyby ever, breaking the record New Horizons itself set in July 2015, when the probe cruised past Pluto. "And we hope to hunt down one more KBO — one more Kuiper Belt object — and make an even more distant flyby in the 2020s," Stern added. "And we've got fuel, and the spacecraft's in great health," Stern said. "So, I think there's a bright future ahead." NASA would have to approve an additional extended mission for all of this to happen. New Horizons' original mission centered on the Pluto flyby, and the Ultima Thule encounter is the focus of an extended mission that runs through 2021. All of this isn't to imply that Stern and his colleagues are looking past the Ultima Thule flyby, which is less than two weeks away. And they're not taking success for granted way out there, even given how well the 2015 Pluto encounter went. Indeed, the Ultima Thule event will be much tougher, Stern said. The object, officially known as 2014 MU69, is much smaller than Pluto — just 23 miles (37 km) wide, compared to 1,477 miles (2,377 km) for the dwarf planet. "So, it's 10,000 times fainter, which is much harder to track and home in on," Stern said. And Ultima lies about 1 billion miles (1.6 billion km) farther from the sun than Pluto does. That means that signals will take considerably longer to get to or from New Horizons — about 6 hours and 6 minutes one way, compared to 4 hours and 25 minutes during the Pluto flyby. This makes mapping out maneuvers much more difficult. In addition, New Horizons is a bit older now, and its RTG doesn't generate as much power as it did back in 2015. So, the mission team has to be more careful about instrument use during the extended mission, Stern said. "All of the those things — the navigation, the comm[unications], the power levels and dealing with some other technical challenges — conspire to make this a tougher and riskier flyby," he said. But the rewards should be substantial, Stern and other team members have said. Ultima Thule is a deep-frozen, pristine relic left over from the solar system's planet-formation period — a sort of time capsule just waiting to be examined. "This region of the solar system, being so far from the sun, preserves the original conditions from 4 and one-half billion years ago for planetary formation," Stern said. "So, when we fly by Ultima, we're going to have a chance to see the way things were back at the beginning." You can arrange to beam a good-luck message out toward New Horizons on flyby day, as more than 22,000 people have done to date, if you so desire. But you better act fast: This mission-run outreach program ends tomorrow (Dec. 21).